The world is big. And small. But really, it's big. My hometown is over 5000km away from my current location. Add another 3000km (give or take) to that and I could travel coast to coast in Canada. I would need to travel 40,008km to go around the world. My daily commute to work is 20km. Another 145 days and I will have travelled an additional 5000km since moving. Another 1895 days, and I will have travelled the distance around the globe. At the same time, the world is small. Within two days of moving across the country, we ran into a high school friend. I visited Winnipeg on a work trip and met someone who went to school 5 minutes from my house back home. When I lived in Halifax, I met someone who used to lived on the street I grew up on. Yesterday, I was on the phone with a call center employee, in a different province, whom I rowed with years ago. Technology helps to close those gaps even further. Facebook tells us our mutual friends, and connects us with strangers. Google can tell you a lot about a person. 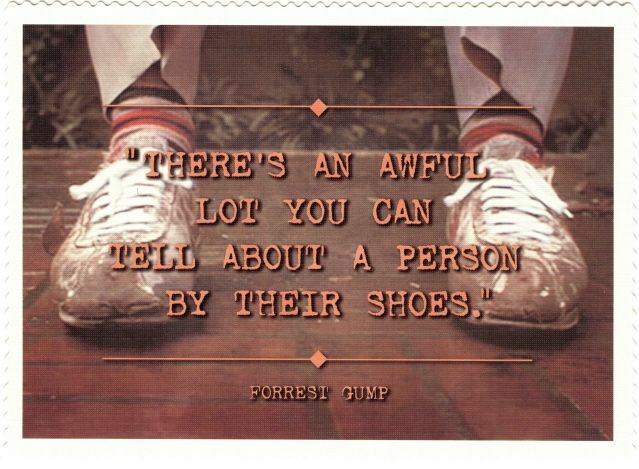 Sometimes, about as much as their own shoes can tell you. Skype and Facetime allow us to see each others faces as much as we want! No matter the distance, we are still connected... if we choose to be. It is a choice. Some might argue this but it is our decision to login, search and click. I'm not saying it is easy to avoid the internet and the technology that keeps us connected, but it is possible. Whether you are in the middle of nowhere or in the middle of a big city, the choice is yours.